11:2.1 Since you are beginning to glimpse the enormousness of the material universe discernible even from your astronomical location, your space position in the starry systems, it should become evident to you that such a tremendous material universe must have an adequate and worthy capital, a headquarters commensurate with the dignity and infinitude of the universal Ruler of all this vast and far-flung creation of material realms and living beings. 11:2.2 In form Paradise differs from the inhabited space bodies: it is not spherical. It is definitely ellipsoid, being one-sixth longer in the north-south diameter than in the east-west diameter. The central Isle is essentially flat, and the distance from the upper surface to the nether surface is one tenth that of the east-west diameter. 11:2.3 These differences in dimensions, taken in connection with its stationary status and the greater out-pressure of force-energy at the north end of the Isle, make it possible to establish absolute direction in the master universe. 11:2.5 We speak of that surface of Paradise which is occupied with personality activities as the upper side, and the opposite surface as the nether side. The periphery of Paradise provides for activities that are not strictly personal or nonpersonal. The Trinity seems to dominate the personal or upper plane, the Unqualified Absolute the nether or impersonal plane. We hardly conceive of the Unqualified Absolute as a person, but we do think of the functional space presence of this Absolute as focalized on nether Paradise. 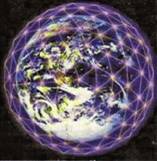 11:2.6 The eternal Isle is composed of a single form of materialization—stationary systems of reality. This literal substance of Paradise is a homogeneous organization of space potency not to be found elsewhere in all the wide universe of universes. It has received many names in different universes, and the Melchizedeks of Nebadon long since named it absolutum. This Paradise source material is neither dead nor alive; it is the original nonspiritual expression of the First Source and Center; it is Paradise, and Paradise is without duplicate. 11:2.7 It appears to us that the First Source and Center has concentrated all absolute potential for cosmic reality in Paradise as a part of his technique of self-liberation from infinity limitations, as a means of making possible subinfinite, even time-space, creation. But it does not follow that Paradise is time-space limited just because the universe of universes discloses these qualities. Paradise exists without time and has no location in space. 11:2.8 Roughly: space seemingly originates just below nether Paradise; time just above upper Paradise. Time, as you understand it, is not a feature of Paradise existence, though the citizens of the central Isle are fully conscious of nontime sequence of events. Motion is not inherent on Paradise; it is volitional. But the concept of distance, even absolute distance, has very much meaning as it may be applied to relative locations on Paradise. Paradise is nonspatial; hence its areas are absolute and therefore serviceable in many ways beyond the concept of mortal mind.